Der Grant ist ein britischer mittlerer Panzer der Stufe 4. Diese Variante des M3 Lee wurde von den USA speziell für den Export nach Großbritannien gebaut, wo es unter dem Namen General Grant (Grant I) eingesetzt wurde. Der Grant führt zum Sherman III. Superior survivability over M3 Lee: superstructure turret is smaller, and its front is stronger. Top engine only gives 10 extra hp, so it can be skipped. Forced to fight at range, due to to limited gun traverse and large profile. Armour is mediocre at close ranges. Accuracy is below average, though still works in its tier. High silhouette, which makes hiding behind rocks difficult. Worse camo than T-28. 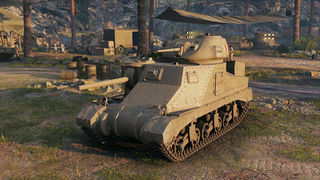 Premium rounds for 75mm guns give little boost in performance and are simply a waste of credits. This tank fights best at the edge of render range, preferably on flat ground with a spotter. This allows it to actually survive without being taken out quickly, due to its large silhouette. While the accuracy is poor, the rate of fire more than compensates for this. Cheap ammo also encourages this type of gameplay. Compared to the M3 Lee this tank is far superior. Notably it is far more survivable as the superstructure turret has been redesigned. The armour has been thickened to 80mm effective thickness after sloping, and the profile has been improved as this tank is without a tumourous commander's cupola (yet, it sports improved view range). 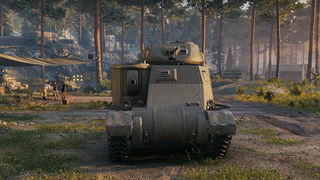 Additionally, the British 6-pound gun has higher penetration and powerful APCR rounds, able to pen tier 5s and 6s tanks much more reliably than the American low-velocity 75mm guns, meaning that this tank has a chance of success once it has been spotted and engaged. However, the 6-pounder has lower dpm than 75mm M3 gun (1800 compare to 2200) and is further inhibited by the fact that it reloads before it aims. Its low alpha damage also makes its premium rounds a very expensive thing to play with. Though not at war, the U.S. was willing to produce, sell and ship armored vehicles to Britain. The British had requested that their Matilda and Crusader tank designs be made by American factories, but this request was declined. With much of their equipment left on the beaches near Dunkirk, the equipment needs of the British were acute. Though not entirely satisfied with the design, they ordered the M3 in large numbers. British experts had viewed the mock-up in 1940 and identified features which they considered flaws — the high profile, the hull mounted main gun, the lack of a radio in the turret (though the tank did have a radio down in the hull), the riveted armor plating (whose rivets tended to pop off inside the interior in a deadly ricochet when the tank was hit by a non-penetrating round), the smooth track design, insufficient armor plating and lack of splash-proofing of the joints. 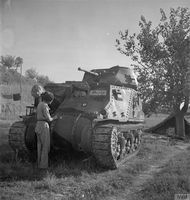 The British desired modifications for the tank they were purchasing, including the turret being cast rather than riveted. A bustle was to be made at the back of the turret to house the Wireless Set No. 19 radio. The tank was to be given thicker armor plate than the original U.S. design, and the machine gun cupola was to be replaced with a simple hatch. 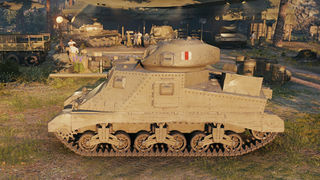 With these modifications accepted the British ordered 1,250 M3s. The order was subsequently increased with the expectation that when the M4 Sherman was available it could replace part of the order. Contracts were arranged with three U.S. companies. The total cost of the order was approximately 240 million US dollars. This equaled the sum of all British funds in the US. It took the Lend-Lease act to solve the United Kingdom's shortfall. The prototype was completed in March 1941 and production models followed with the first British specification tanks produced in July. Both U.S. and British tanks had thicker armor than first planned. The British design required one fewer crew member than the US version due to the radio in the turret. The U.S. eventually eliminated the full-time radio operator, assigning the task to the driver. 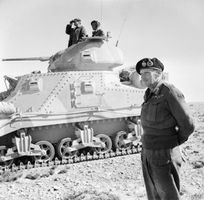 After extensive losses in Africa and Greece the British realized that to meet their needs for tanks both the Lee and the Grant types would need to be accepted. Some of the tanks had their turret guns replaced with the 2 pounder, and the hull gun with the 6 pounder. The U.S. military used the "M" (Model) letter to designate nearly all of their equipment. When the British Army received their new M3 medium tanks from the US, confusion immediately set in, as the M3 medium tank and the M3 light tank were identically named. The British Army began naming their American tanks after American military figures, although the U.S. Army never used those terms until after the war. M3 tanks with the cast turret and radio setup received the name "General Grant", while the original M3s were called "General Lee", or more usually just "Grant" and "Lee". 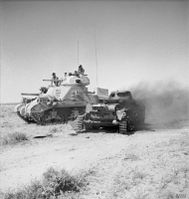 The M3 brought much-needed firepower to British forces in the North African desert campaign. 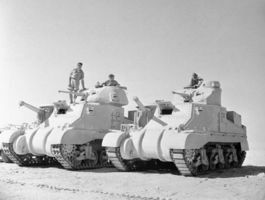 British M3 Grant (left) and Lee (right) in the Western Desert, 1942, showing differences between the larger British turret and the original design.